﻿Load Capacity up to 20,000 lbs. Designed to meet the needs of the Aviation Ground Support equipment industry, the use of Pivoting Axle Casters assures that if one wheel goes on a higher surface, the axle will pivot to keep both wheels under load. It is essential when handling heavy loads that both wheels remain on the ground at all times to avoid an overstress condition. ﻿Low Height Kingpinless Dolly Casters are designed for special applications where heavy equipment is moved over level surfaces. 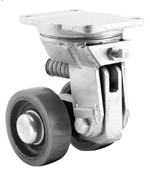 These casters have high load capacity in relation to its overall height. This is due to the kingpinless construction with a large diameter caster ball race and the wide wheel. ﻿Low Height Dual Wheel Dolly Casters (Type LL) have high load capacity in relation to its overall height. This is due to the center line of the wheels being within the circumference of the large diameter swivel bearing and the benefits of the differential action of dual wheels. Load Capacity up to 1800 lbs. ﻿Primarily used in the theatrical and movie making industries for moving scenery, props and stage equipment. StageMaster incorporates three swiveling casters attached to a heavy-duty swiveling platform base that easily mounts to the item to be moved. The swiveling action of the casters combined with the swiveling action of the platform base allows to operator to easily maneuver heavy, awkward devices in tight quarters with relative ease. Load Capacity up to 210 lbs. ﻿﻿Gate & Ladder Casters are designed to make gate opening and closing easy. 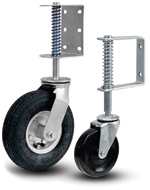 Casters feature gate mounts and spring loaded shock absorption. ﻿Custom gate and ladder casters available in stainless steel with Nylacron™ wheels. ﻿Load Capacity	Up to 350 lbs. Urethane Shopping cart wheels both mechanically lock and chemically lock the tread to the wheel core. Load Capacity up to 2200 lbs. ﻿﻿﻿Stabilizer acts as a miniature "total lock" when fully engaged – prevents caster/equipment from moving. Double race swivel design. Available in hole type, plate type and stainless steel. Load Capacity up to 1000 lbs. Four-Sided, Double-Ball Raceway: Hardened steel ball bearings in the load bearing and secondary thrust bearings touch the swivel raceway “on all four sides.” This protects the extra heavy duty 1” diameter central king pin from shock loading for free swiveling under heavy loads. Heat-Treated Moving Parts: All moving parts are heat treated to a precise molecular depth and Rockwell hardness. This extends caster life under rugged conditions and shock loads. Load Capacity up to 185 lbs. ﻿﻿High Temp Bakery Casters ﻿have excellent wheels for bakery rack, soft tread wheels to protect your floors and roll quietly. ﻿﻿Our food industry casters assist you with your food maintenance equipment caster needs. From light duty, to heavier duties, we have the right product to fit your caster application. Prevenz™: The antimicrobial compound used in Prevenz™ wheels is designed to suppress and neutralize the growth of a variety of destructive and odor causing microbes including bacteria, molds, mildew, and fungi. The images to the right show the difference in bacterial growth over a seven day incubation period. ﻿Load Capacity	Up to 325 lbs. ﻿Load Capacity	Up to 220 lbs. • Brake Pedal: corrosion resistant nylon. Rubber: The ideal and original ball castor for transport in the glass industry has been invented years ago by Romeca. This ball castor does not damage the glass, is strong and very practical in use. We can supply you this ball castor with different diameters and turning circles, with left- or right-bended swane neck. • Temperature range: -20 °C. to +150 °C. • Temperature range: -20 °C. to +80 °C. ﻿﻿﻿Developed specifically for food handling and processing industries where equipment sanitation is essential. 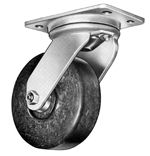 These casters are designed to reduce waste build-up which also facilitates complete clean-up. 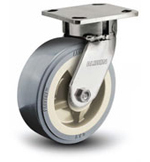 All sanitary casters are available with Nylacron™ wheels. Typical Applications: ﻿Bakeries, bottling plants, cafeterias, canneries, candy plants, chemical plants, dairies, hotels, institutions, meat processing plants, pharmaceutical houses, restaurants, wholesale suppliers and supermarkets. Load Capacity up to 8350 lbs. ﻿﻿﻿﻿Designed for use on inverted angle track for any service requiring guidance of the truck or conveyor unit. or ovens, and in assembly or processing operations where rivets, bolts or other wheel stopping hazards might impede normal movement. 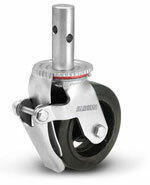 ﻿﻿﻿﻿﻿The hotel and related hospitality industries use some unique and standard casters. Luggage or bellman carts, hand trucks, house cleaning carts, room service carts, laundry carts, mop buckets, garbage & material handling hoppers, wire racking, food service equipment, catering carts, audio visual carts, etc. Load Capacity up to 800 lbs. Designed for scaffolds. This caster features an easy to engage total locks that locks both wheel and swivel and allow easy locking and repositioning. Cold forged top plate, yoke and button are all heat treated to prevent brinelling, improve swivel action and increase service life. Load and thrust bearings are hardened and ground and rotate on hardened raceways. All swivel sections are equipped with a lubrication fitting for field maintenance. Notched yokes are standard. Patented Kingpinless™ single ball bearing precision machined raceway, to 53 Rockwell C minimum, lube fittings for swivel bearings and for wheel bearings. Swivel section features a 2-3/8” diameter raceway with 3/8” ball bearings. Notched yokes are standard. Patented Kingpinless™ single ball bearing precision machined raceway, to 53 Rockwell C minimum. Swivel section features a 3” diameter raceway with 1/2” ball bearings. Lube fittings for swivel bearings and wheel bearings. Notched yokes are standard. 4-1/2” diameter raceway with 3/4” diameter carbon steel balls. Precision machined and hardened to 53 Rockwell C minimum. Load and thrust are accommodated by our Patented Kingpinless™ design. Sealed raceway is standard. Swivel Top Plate - SAE 1045 hot steel forging. Swivel Yoke Base - SAE 1045 hot steel forging. Patented Kingpinless™ single ball bearing precision machined raceway, to 53 Rockwell C minimum. 7” diameter raceway with 3/4” diameter ball bearings. For additional Pneumatic and Semi-Pneumatic Casters, download our Pneumatic Casters PDF. lope and wobble while rolling. • Swivel Construction: double ball bearing. 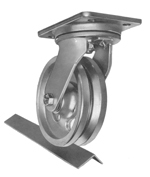 • Zerk Grease Fitting: swivel raceway. • Fork Leg Spacing: 8” wheel 3”. 10” wheel 4”.